Ottawa Humane Society: Calling all rabbit fans: meet Caramel! Calling all rabbit fans: meet Caramel! Hop Hop! Calling all rabbit fans! 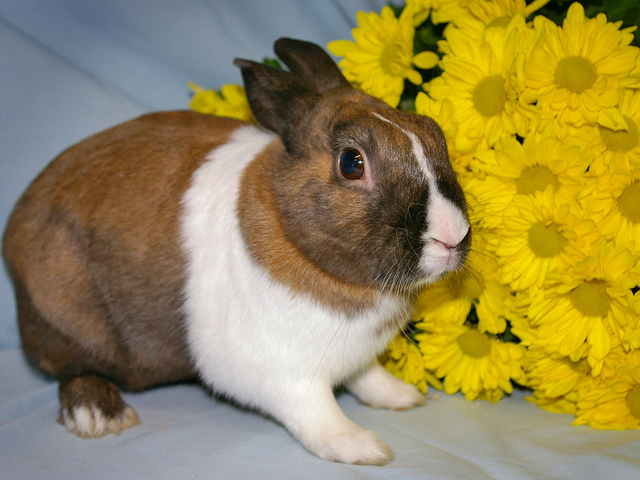 Meet Caramel (A122446), an energetic, 4 year old, male dwarf mix rabbit. He has beautiful brown and white colouring. His previous family felt they could not offer him enough time. Did you know rabbits need at least two hours consecutively outside of their cage to run and exercise? And that is the bare minimum! Caramel would really benefit from someone with even more time to spend with him. Although he enjoys being in laps for short periods of time, he isn’t a big fan on being picked up, then again most rabbits aren’t. Like any rabbit if left outside of his cage unsupervised he is likely to chew on things he shouldn’t, like wood, carpet and even wires! Wires represent one of the biggest dangers as a rabbit could potential zap himself. Ouch! It is important to "bunny proof" before bringing your new addition home. His new cage also needs to be lined with either shredded paper, recycled newspaper pellets or other type of bedding, as Caramel is allergic to shavings. To learn more about rabbits as pets, check out our online pet rabbit guide. To adopt Caramel, contact us at 613-725-3166 ext. 258 or send us an email at adoptions@ottawahumane.ca. Hamsters and hamsters and hamsters, oh my! Friday Fun: Every Home Needs a Harvey!